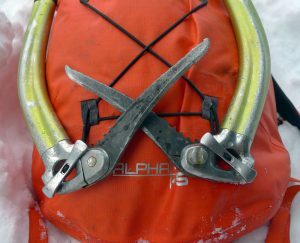 Field Test review of the Arc’teryx Alpha FL 45, a waterproof alpine and ice climbing pack. The fully waterproof Arc’teryx Alpha FL 45 pack for ice and alpine climbing. You would have to watch The Full Monty to see strippage equal to that of the new Arc’teryx Alpha FL 45. This pack is so spare it could squat in a Zen garden and remain unnoticed by Master Po. It is, basically, a tube of N400r-AC2 ripstop with lightly padded shoulder straps and a webbing waistbelt. Unless you look closely. Then you may notice an exterior, zippered kangroo pocket that can hold a handful of GUs, a cap, or a QuickClot compress—this is, after all, an alpine/ice pack. Oh, and there’s a full extension sleeve that rolls up dry-bag style, and dual haul loops. 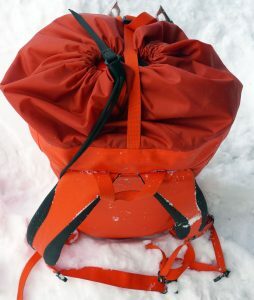 A tie-down strap atop the pack secures a jacket or rope, and a sexed-up web of bungee cords and flanges carries two tools, crampons or fluffy clothing. The back panel is thinly padded with what feels like ping-pong-paddle rubber. The Alpha FL is called the 45 because it extends to 45 liters, but it is really a 32-liter pack (1,831 cubic inches) that upsizes to around 40 liters. Realistically, you aren’t going to want to carry it much when it is stuffed to maximum capacity, when it becomes as tipsy as if it has two martinis under its belt. Comfortably, the pack can hold a day’s worth of gear and goods for light-and-fast going in the mountains. Overnight? Probably not. 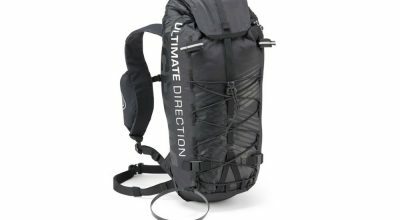 Perhaps the pack’s most unique feature is its waterproofness. Every seam is taped and the fancy rubbery fabric I mentioned earlier is nearly haul-bag tough. Toss in the roll-top closure, a seal proven in the boating business, and you could confidently store gunpowder inside the Alpha. 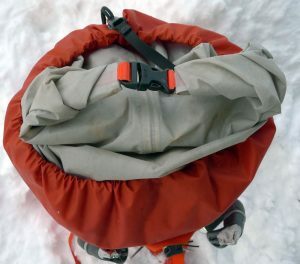 The Arcteryx Alpha FL 45 has a dry-bag type roll top instead of a conventional top lid. But do you need a waterproof pack? If you live in the rainy Pacific Northwest and endure long, wet approaches, yes. In the relatively dry Rocky Mountains I’ve climbed for 25 years, no. Weighing 1 pound 7 ounces, the Alpha is one of the lighter packs in its category. 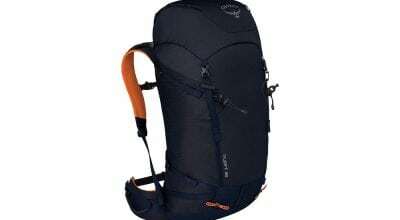 To compare, the Cilo Alpine Day Pack ($169), the closest comparable model I could find, has less capacity at 30 liters and has a stripped weight of 1 pound 4 ounces. When the Alpha is loaded with heavy rack and a rope, carry comfort is fair, but better than you might think for a pack with such a simple suspension. The firm shoulder straps don’t dig in, and the minimal back panel can, surprisingly, keep pokies at bay. The hip belt is just webbing, but most of the time when you will carry a pack like this you will be wearing winter pants or wearing a harness, so … so what? The biggest ding for me was the pack’s lack of a top lid. Having to dump everything into the main body, then rummage around for the goodies is a hassle. And while I just noted that the roll-top keeps things dry, it is also a hassle and I seldom used it, preferring instead to close the top by yanking on the conventional drawcord closure. 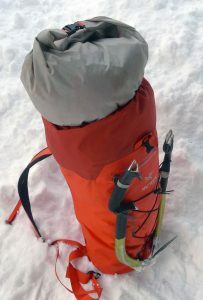 I usually ignored the roll-top and instead used the drawcord, creating a hole that let snow funnel into the pack. In this mode, the pack lets snow funnel into the main body. When the Alpha 45 first arrived I was dumbfounded. How do you attach ice tools? I had expected to find standard ice-tool loops or tubes, and the two metal cleats that actually are the tool carriers put me into a spin. Once I figured out, via an online photo, that you thread the cleats through hole in the head of your tools, and tuck the shafts through the elastic, all was good. Better than good, actually, as the Arc’teryx system isn’t just novel, it is easy to use and fast. In temps in the teens or lower, however, the bungees lost some of their elasticity. I never had a tool or anything else fall out, but it seemed like it could in the right conditions. Simply put, the Alpha 45 FL is a complicated simple pack. There’s more to it than meets the eye. Minimalists take note. ABOUT THE RATING I gave the Alpha 45 FL three of five stars, deducting one star for lack of a top lid, and another for being spendy. • Simple alpine pack that gets the job done. • Very durable and totally waterproof. • Roll-top sleeve can extend capacity from 32 to 45 liters, if pushed. • Minimal suspension, but carries better than expected. • Novel but nice ice tool carriers. The Alpha FL 45 has unique metal cleats that you thread through your ice tools. This is quick and easy even when your hands are cold, but the elastic loses its snap when it is frozen, potentially letting the tools fall out. 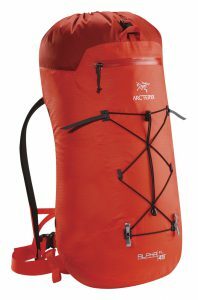 The Arcteryx Alpha FL 45 is called a 45 liter pack, but when it is filled to 45 liters it is top heavy and unwieldy. In reality, it is more like a 32 to 40 liter pack.